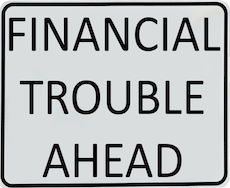 It can be hard, sometimes, to identify when you might be headed for financial trouble. You might think you are doing fine for now, but what happens if you run into an unexpected expense? And are your finances sustainable as they are? Do you only make minimum payments each month? If you find yourself only able to make the minimum required payment, that could be a sign of trouble. That normally means that you have maxed out your credit cards, and that you don’t have the money to pay off your balance. If you find yourself only making minimum payments, and not putting more toward debt reduction, and not paying off your balance each month, that’s indication that things aren’t going well. You don’t have enough money to support your current habits if you are struggling to pay the minimum on your debts. It seems like you are doing fine when you occasionally move money from your savings account into your checking account. It often doesn’t register that you are struggling financially when you have to dip into other accounts to make things work. After all, you do have the money. However, this is a sign that you aren’t living within your means. If you have to draw from your TFSA, or from some other account, that is an indication that you aren’t managing your resources effectively. Look at where your money is coming from. If you seem to have an “emergency” every month that results in you drawing on extra funds, that’s in indication that you could be headed for financial trouble. When you are living below your means, you should have some room for saving in your budget. If you look at your situation, and you insist that you don’t have any money at all for savings, that’s a very real indication that your finances could be in trouble. Not only do you not have enough money to set aside for the future, but it also means that your dwindling emergency fund won’t be as helpful in the event that a real financial emergency strikes. If you don’t think that you can afford to set aside money for savings, you need to double check your financial situation and habits — and possible make some serious changes to the way you are doing things. Are you trying to shuffle your bills around? Are you holding that check for the electricity until the last minute? Have you taken your car payment off automatic debit? If you are trying to move your bills around, and especially if you find yourself paying late, or trying to figure out which bills you can let slide, it might be an indication that you are in financial trouble. It’s not easy to budget when you’re broke, and if you find that you are struggling with your bills, and trying to move them around so that the due dates work out better for you, it might be time to try to figure out how you can get your finances back on track. Most of us worry about money sometimes. However, if just the thought of money is stressing you out, it could be a very real indicator that you are in financial trouble. If you don’t like to see the bills, and if you are on edge about money, it could be a red flag that you really are headed for financial trouble. This kind of stress about money is very telling. When money is causing strain in your personal life, including your relationships with your friends and family, you are probably in trouble. That’s not a good place to be. If you are experiencing the signs that you might be in financial trouble, it’s a good idea to take a step back and consider your situation. Why are you in this position? And what can you start doing, right now, to get on the right track?